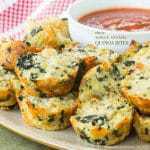 An easy party appetizer packed with all the flavors of your favorite Italian meat sauce in one low carb bite-sized package. 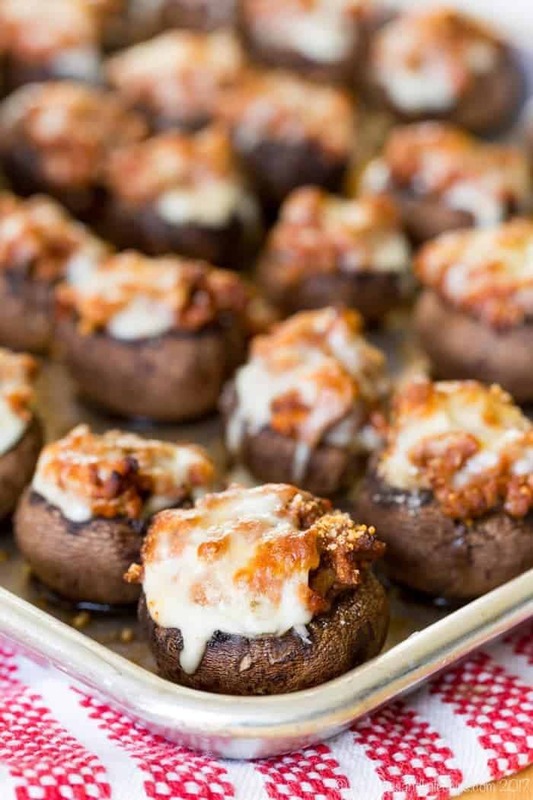 Bolognese Ground Beef Stuffed Mushrooms are an easy party appetizer packed with all the flavors of your favorite Italian meat sauce in one bite-sized package. 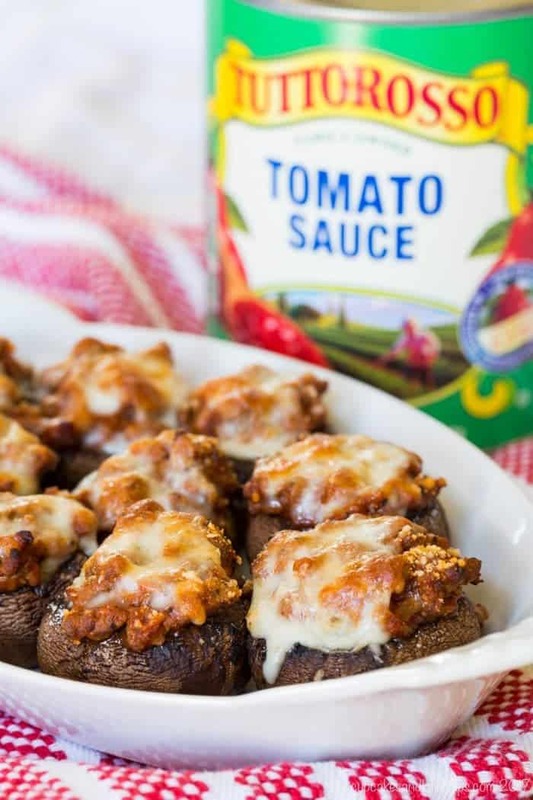 With a sprinkling of mozzarella and parmesan cheese, these low carb, gluten free stuffed mushrooms are going to be one of your favorite gluten free appetizers or even a simple dinner alongside a salad. Disclaimer:This recipe was developed through a sponsored partnership with Tuttorosso. As always, all opinions are my own. I wish I had been able to spend more time with my paternal grandmother throughout my life. She was as quick with a joke as she was with her temper, but we all loved that fiery personality. She loved board games, and enjoyed teaching us as much as she loved beating us. Oh no, there was no letting the grandkids win. She fought for every point, space on the board, or winning hand, and would not go down without a fight. But she loved us to no end. Sadly she moved to Texas when I was very small, and I only had the opportunity to visit every now and then, which is unfortunate because there is one thing I would have liked to learn from her… canning. Yes, I wish I knew how to take fresh fruits and vegetables from the summer harvest and preserve the freshness and nutrition to enjoy all year long. I know she knew how to do it, but I was never around her long enough when I was at an age where I was ready to learn. I know I could probably figure it out, but it would have been a great experience to have learned from her, especially since I am not sure anyone else in my family knows how to do it either. I know some people still break out the glass jars to can their food, but it seems to be an art that is slowly fading away, and so many people do not have a personal connection with the preservation of food. These days it seems most people associate preserving food with adding chemicals and sticking it in a box on a store shelf. That’s why I love that Tuttorosso is spreading the word to consumers that their canned tomatoes are more like those jars of tomatoes that were canned on farms and in homes with tomatoes from the garden in generations past. After selecting the most perfectly ripe tomatoes, Tuttorosso preserves them with only steam, never adding any artificial colors, flavors, or preservatives. These easy low carb stuffed mushrooms are made with real ingredients! 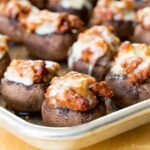 For this stuffed mushroom recipe I was inspired by the extra meaty meat sauce I had made from my friend Carolyn’s cookbook, The Everyday Ketogenic Kitchen. While that sauce was amazing over zoodles, I thought it would also make an amazing filling for these Bolognese Stuffed Mushrooms. I changed the recipe a bit to simplify it a bit, because whether it’s for the holidays or a party, you are busy, so you want your recipes extra quick and easy. How do you make Bolognese Ground Beef Stuffed Mushrooms? You can use cremini (baby bella) or white mushrooms. Start by wiping any dirt form the mushrooms and removing the stems. Then place them bottom up on a sheet pan. In a skillet, brown the ground beef and drain the excess grease. Season with garlic, salt, pepper, and Italian seasoning, then add a can of tomato sauce. Let the meat sauce simmer until it is extra thick. Next, scoop the filling into the mushroom caps and top with shredded mozzarella and grated parmesan cheese. Bake at 400°F for about 20 minutes or until the cheese it melted and brownes. 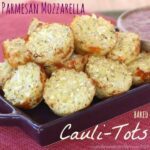 Serve them as a party snack, or even alongside an Italian Style Wedge Salad for a light and simple dinner. Are ground beef stuffed mushrooms gluten free? 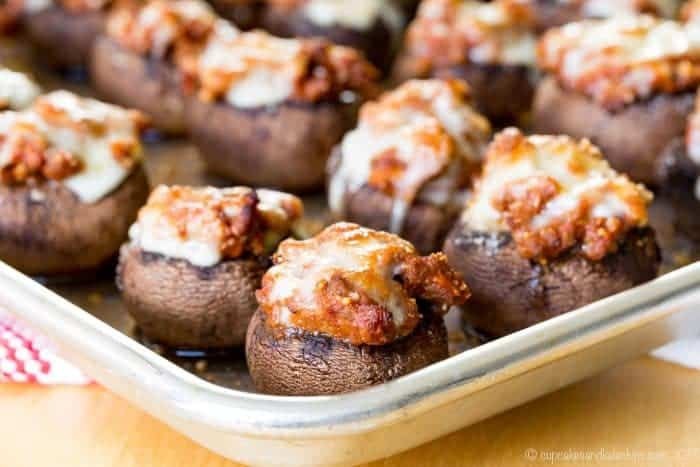 Unlike other stuffed mushroom recipes, these Bolognese Stuffed Mushrooms don’t have bread crumbs to bind the mixture, making them naturally gluten-free and low carb. And they are made from unprocessed and wholesome ingredients, like fresh mushrooms, ground beef, a few dried herbs and spices, and Tuttorosso Tomato Sauce. Besides being my favorite canned tomatoes, Tuttorosso is the best selling Italian inspired canned tomato brand in the US. And you can feel good about serving Tuttorosso to your family because their family takes pride in sustainably produced tomatoes, NON-GMO harvest and Non-BPA lined cans. Learn more and get recipe ideas and inspiration by following Tuttorosso on Facebook, Twitter, Pinterest, and Instagram. What are more gluten-free appetizers you can make or serve with your favorite Tuttorosso products? Instead of mini quiche, serve up Tomato and Cheese Omelette Muffins from The Little Kitchen. Take a dip into Queso Fundido from Wishes and Dishes. 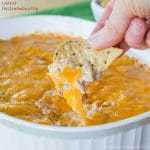 Or scoop up Lasagna Dip from That Skinny Chick Can Bake. 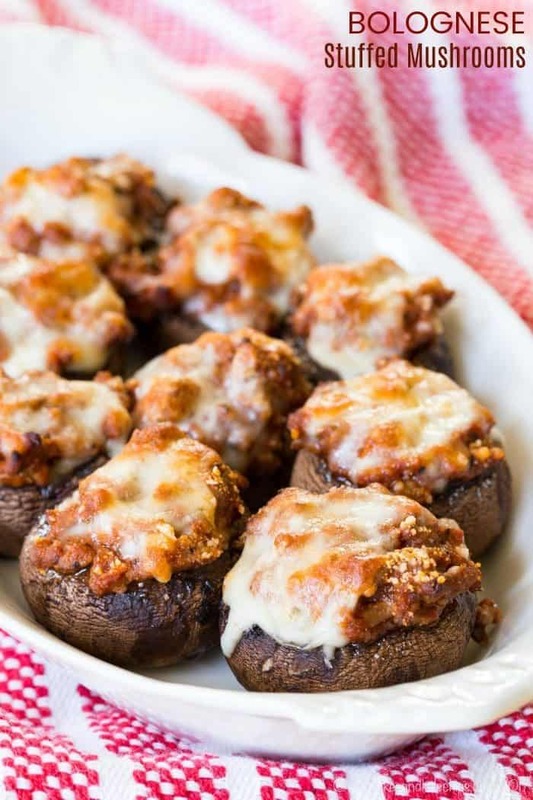 These low carb stuffed mushrooms are the perfect party snack. Easy to make, hearty, and packed with flavor, your guests will be begging for the recipe. Mushrooms are filled with a simple, extra thick bolognese sauce and topped with two kinds of cheese. Then they baked till hot, tender, and golden. Bolognese Stuffed Mushrooms have big, fresh flavors in one little bite. Preheat oven to 400°F and place the mushrooms with the bottom facing up on a sheet pan. In a large skillet, brown ground beef and drain and excess grease. Add the garlic, salt, pepper, Italian seasoning and red pepper flakes, and cook for another minute or two. Stir in the tomato sauce and simmer for 15 minutes, or until the mixture is very thick. Season with additional salt and pepper, if needed. Divide the meat mixture between the mushrooms, packing it in well (you may have a little leftover). Sprinkle the mozzarella cheese and parmesan cheese over the meat mixture in the mushrooms. 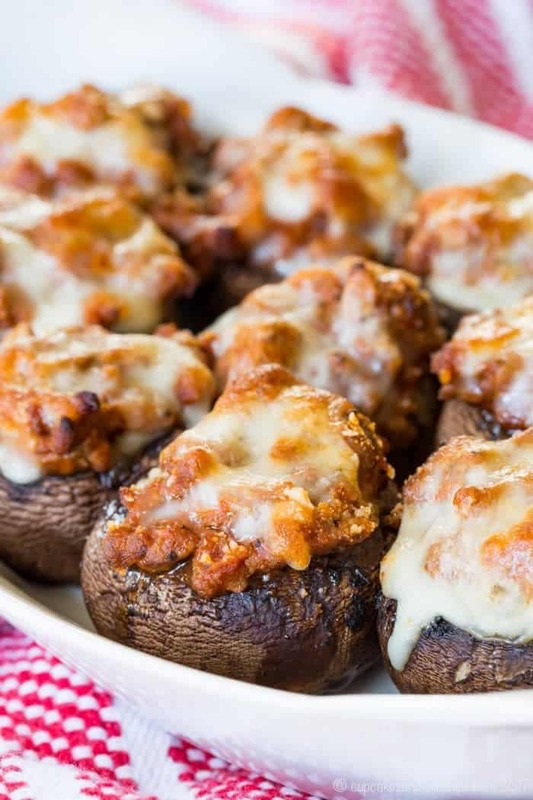 Bake at 400°F 20-25 minutes, or until the mushrooms are tender and the cheese is golden brown. Bolognese sauce is adapted from The Everyday Ketogenic Kitchen cookbook by Carolyn Ketchum of All Day I Dream About Food. The perfect Keto recipe. A home run. Looks like Tuttorosso has a good product. I find canned tomatoes are so much better than many store bought tomatoes. Thank you! I’m glad you enjoyed the recipe. 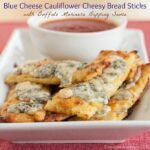 I love this idea so much I can’t wait to try it for a low carb dinner idea! Those tomatoes are the best! What a terrific filling for stuffed mushrooms! Who could resist that cheesy topping???!!! These look amazing! Such a beautiful presentation as well.